The only cards I’d like to keep are Permafrost and Hydrogarm. What changes do you recommend I make to improve this deck? Currently i don’t know what your game plan or win condition is so take my advice with a grain of salt. 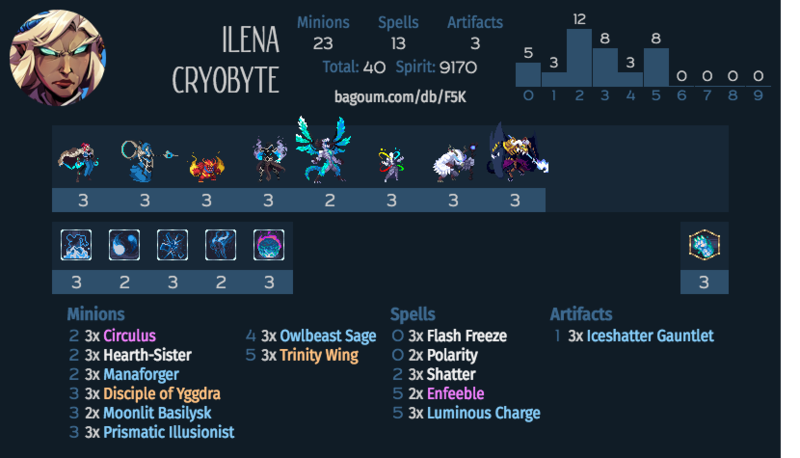 Iceshatter Gauntlet and Disciple of Yggdra are (the only ) good Ilena cards and should be in all of her decks. Cryoblade, on the other hand, is quite bad. I’m also not a fan of Hydrogram, especially with a general who requires a target to cast her BBS at all, but it’s an acceptable power level if you like how it plays. Finally, Cryptographer + Bloodbound Mentor is a great engine for general whose BBS stacks, but Ilena is not one of them. You can get some neat board clears with Gauntlet+Scythe+Permafrost, and have a theoretical endgame of general/Voracity beats backed up by Grove Lion or Alcuin-looped Shrouds. pretty nifty thing you have going with the cryogen pulling garm 100% of the time. How’d that work out for you so far? Does Coldbiter kill a stunned enemy minion if you have Iceshatter too? Sadly even @wardl nor myself was able to get a stun deck functioning well or find the secret of the stun finisher. 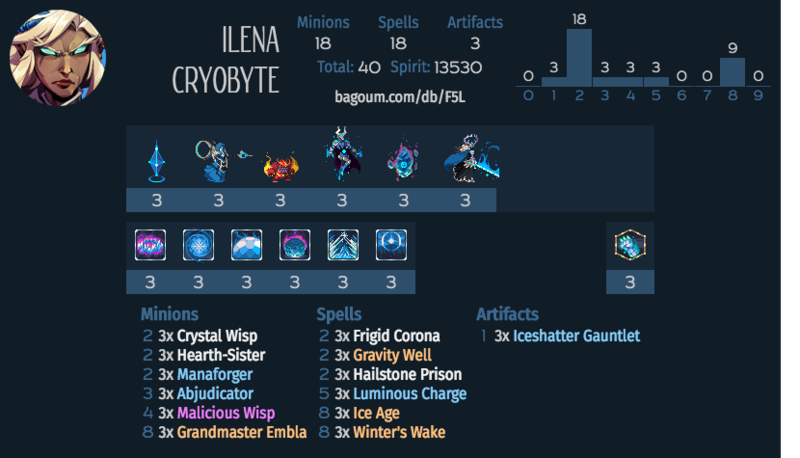 As for now stun is a good tool but not something to build a deck around, just as @owlbeastmd suggested ramp wall ilena is a good deck however I created other ramp deck that utilize stun a little more so it might give you the ilena feel you seek so bad. The deck did make it to into s rank and was way fun to play then his older sibling. The artifact boardwipe combo only works if you have Winterblade + Iceshatter Gauntlet + Resonance Scythe equipped in that order, as artifacts trigger their effect in the order they are equipped. Another note about said combo is that you can actually only destroy 3 minions with it before your artifacts break (unless you also add Concealing Shroud to the combo), since Winterblade stuns after you attack and receive a counterattack. 6 weird gimmicky useless Vanar decks!